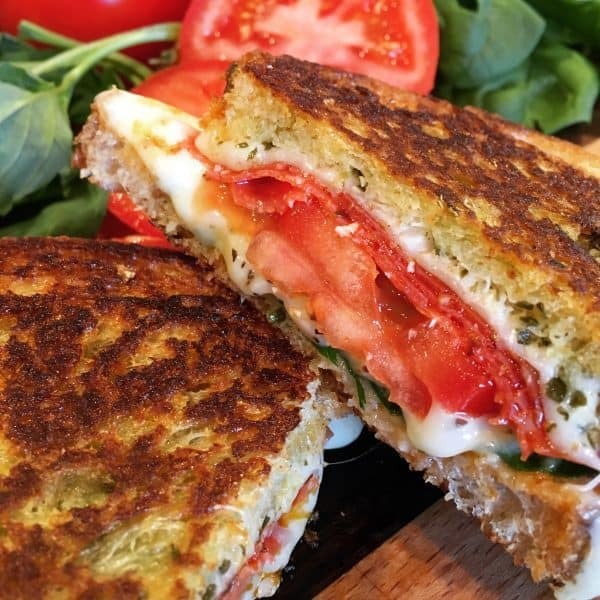 Kicking Up Traditional Grilled Cheese with this AMAZING Italian Grilled Cheese Sandwich. 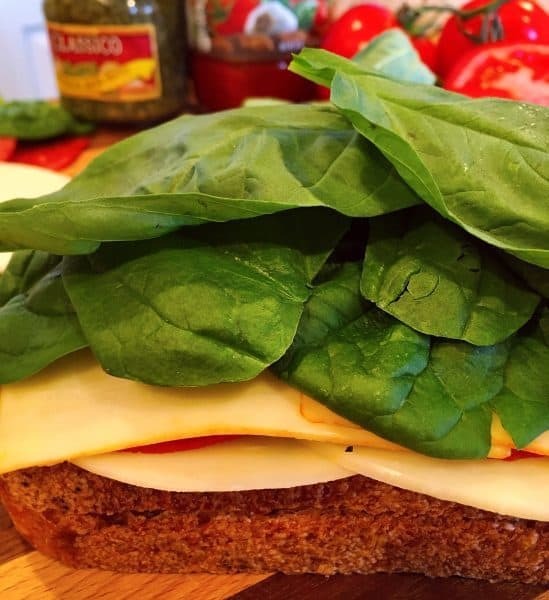 I’m toasting thick slices of golden buttery Rosemary Olive Oil Artisan Bread and filling it with melted Provolone and Munster Cheese, Pesto, Fresh slices of juicy tomatoes, Spinach, Fresh Basil Leaves, and thin slices of Pepperoni. Served with a side of marinara sauce for dipping. Any who…back to my story! I spied this gorgeous loaf of Rosemary Olive Oil Bread. It was truly stunning. TIP: If you can’t find Rosemary Olive Oil Bread you can use an Artisan Asiago Bread or a really beautiful Country French Loaf. Both will work for this sandwich. 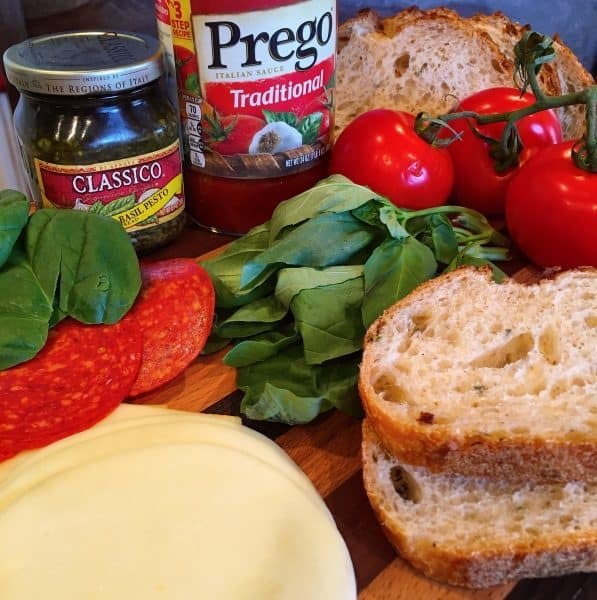 To create these delicious sandwiches you’ll need 1 loaf of Artisan Bread, Butter, Fresh Tomatoes, Fresh Basil, Spinach Leaves, Provolone Cheese, Munster Cheese, prepared Basil Pesto, Deli Pepperoni, and your favorite Marinara sauce. On top of the pesto sauce, add two slices of Provolone Cheese, and 5-6 Large thin slices of Pepperoni. Add a layer of thinly sliced fresh tomatoes, sprinkle with coarse black pepper. Guess what time it is? Yep! Time for another layer of cheese! Add a layer of Munster Cheese. Why Munster? 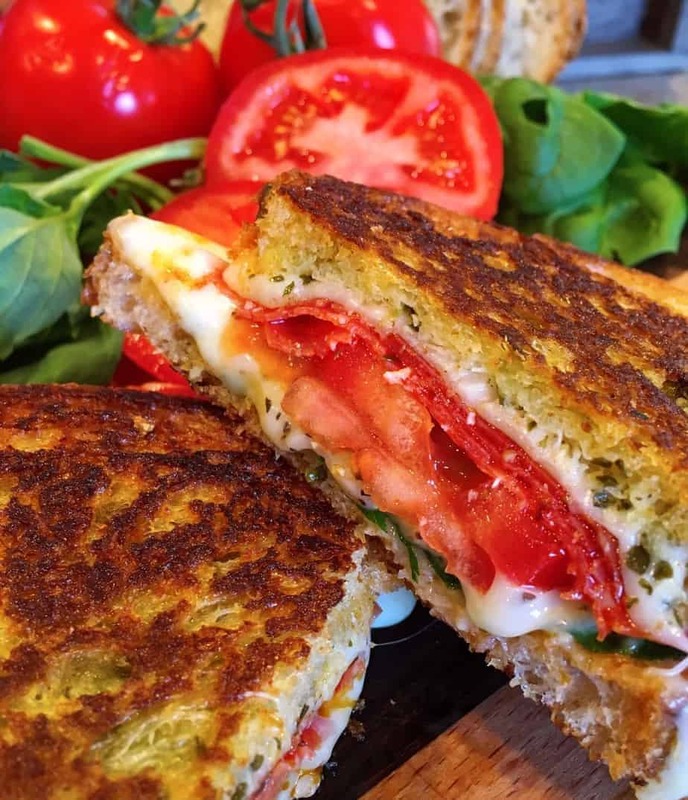 Because it is creamy, yummy, and melts perfectly in grilled cheese. I’m of the opinion that ALL Grilled Cheese should contain Munster. Try it…you’ll thank me! Place the top piece of butter bread, ummm… on top! Place sandwich on hot griddle. Over medium heat. TIP: You don’t want the grill too hot or the bread will toast before the cheese melts. When one side is golden brown…Flip the sandwiches over using two spatula’s. While the sandwiches are toasting…heat individual cups of marinara sauce. I used Prego Traditional Spaghetti Sauce. You can use any brand you like. This sandwich is loaded with so much flavor. Please…PLEASE dip it in the marinara sauce while eating. You’ll thank me! It’s great on it’s own…but dunked in that warm marinara sauce…it’s OUTSTANDING! You could even serve them with a wonderful roasted tomato soup. Another Epic choice! I’ve had two of these sandwiches this week. (There go all my secrets!) 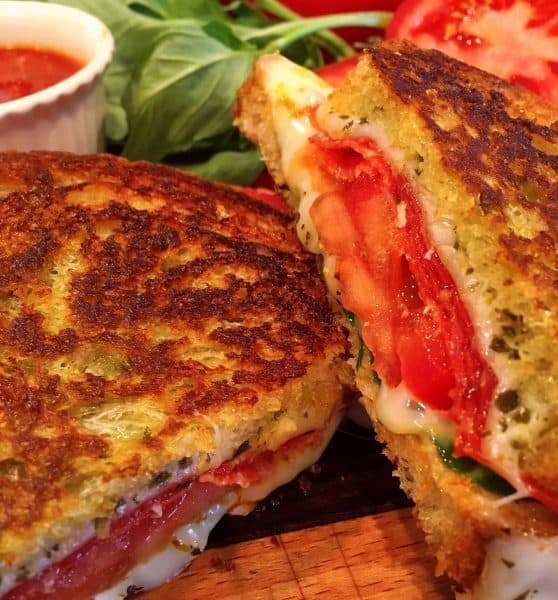 This Italian Grilled Cheese Sandwich has ruined me for regular grilled cheese! Truly! 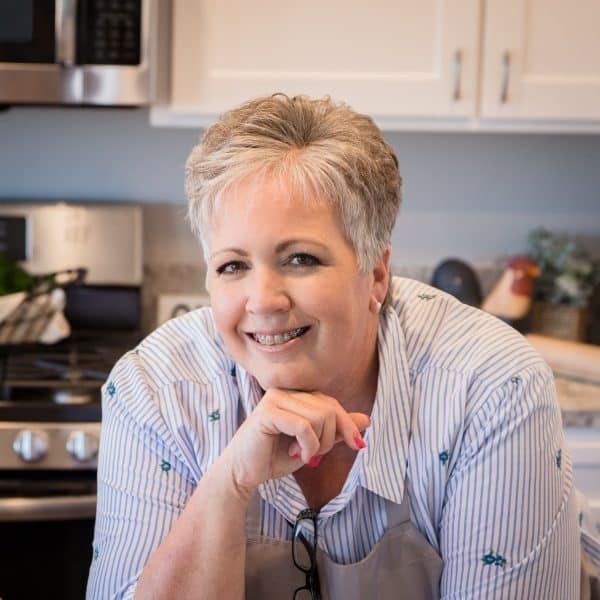 This recipe will make 4 large Grilled Cheese! Hope you love it as much as I do! Printable recipe is below. Have a GREAT Day! I’m sharing this deliciousness at The Weekend Potluck and Meal Plan Monday! You can click on them to find all the YUM going on! 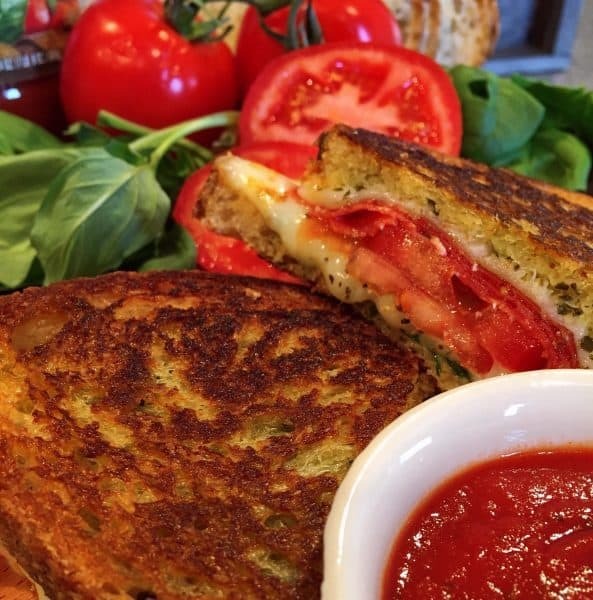 Italian Grilled Cheese Sandwiches make a fantastic lunch or dinner. Loaded with flavor they're one of the best sandwiches to pass your lips! On the inside of four slices of bread, spread Pesto Sauce, about 1 Tablespoon. 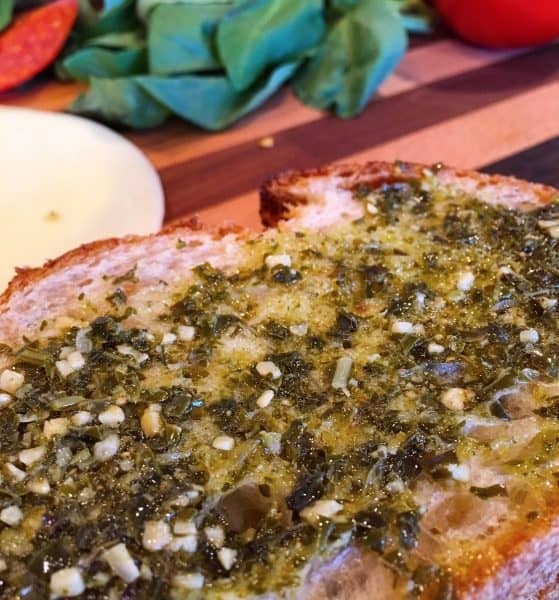 Place two slices of Provolone Cheese on top of each slice of bread with pesto. 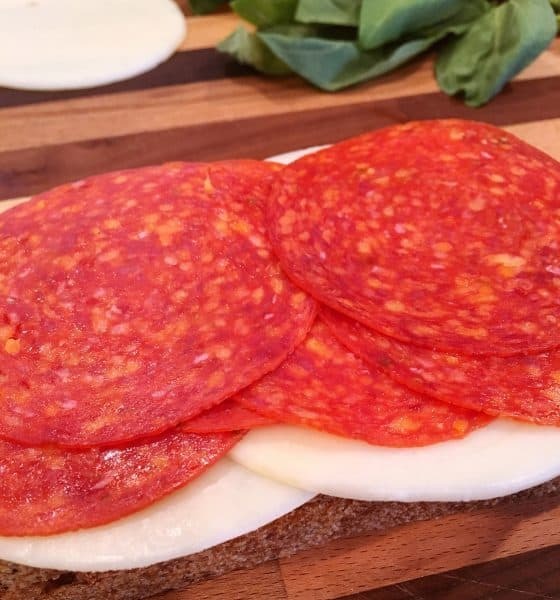 Add 5-6 slices of thin pepperoni to each sandwich. 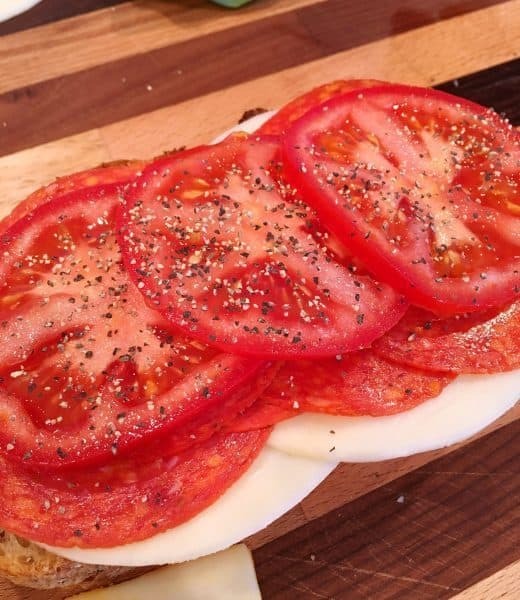 Top with 2-3 slices of tomato. Sprinkle with coarse black pepper. 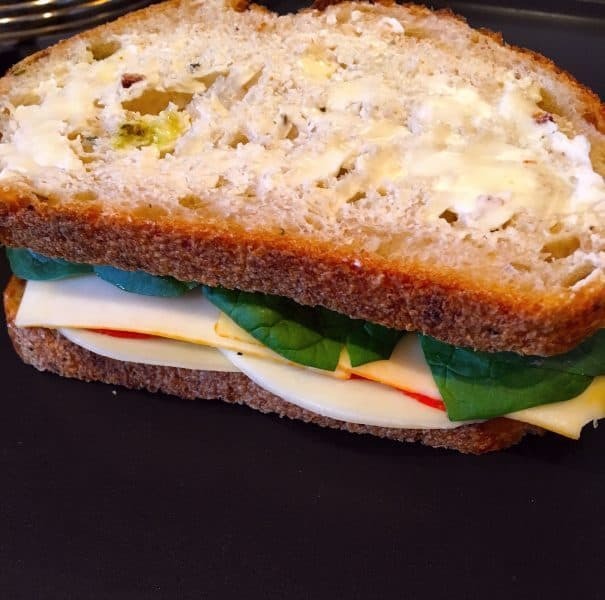 Top each sandwich with two slices of Munster cheese. Add Spinach leaves and a thin layer of fresh basil. Place sandwich butter side down on hot griddle. Grill till bread is golden brown and cheese is melting. Flip sandwich over and toast till done. While sandwich is grilling fill small cups with marinara sauce and warm in microwave. I’m writing the ingredients for this recipe in my trusty grocery list phone App right now. Can’t wait to make it! My 24 year old (pepperoni pizza hound) will love it! I’m one of those people who have never tried Munster in a Grilled Cheese Sandwich. I always love trying something new! 🙂 Have a great weekend! Oh my, these sandwiches look so good. What a great combination of ingredients. Your picture of the sandwich is amazing. 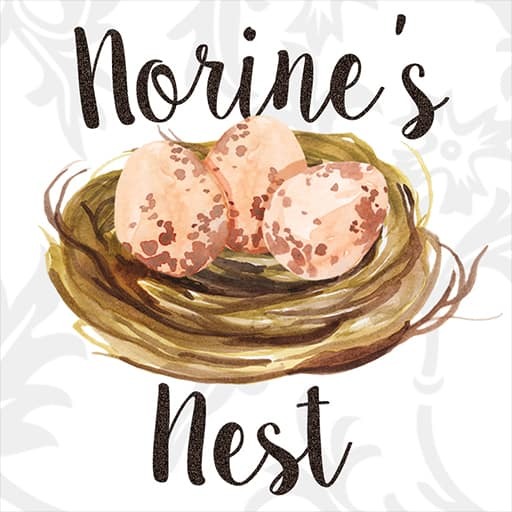 Keep up the good work in your emptier nest; mine is getting that way too. Thank you so much for your sweet compliments. Ya made my day. 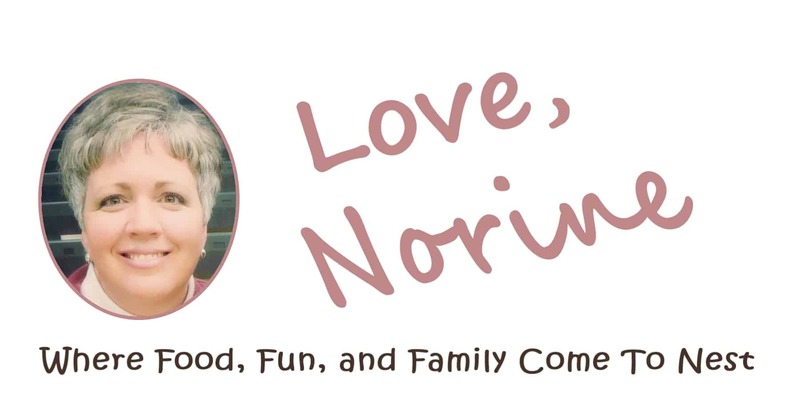 I hope you had a great Mother’s Day! Thanks for stopping by.